Culms: Erect, stout, rigid, unbranched, round. Leaves: Blades 2-4, cylindric, often exceeding culms, less than 1/5 inch wide, thick, hollow, circular in cross-section, divided into partitions, glabrous, diverging abruptly from culms; bases sheathing culms; auricles rounded. Inflorescences: Heads, spherical, dense, 1-20, stalked, terminal, about 1/2 to 3/4 inch in diameter, 30-80-flowered; bracts leaf-like, exceeding inflorescence. Flowers: Perianth segments narrowly lanceolate, about 1/5 inch long, tapered to long points, greenish, turning gold or brown after flowering; outer perianth segments longer than inner; stamens 6, about 1/2 as long as perianth segments. 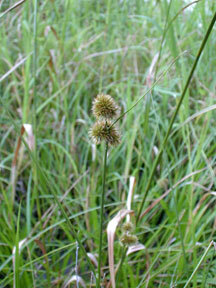 Fruits: Capsules, narrowly awl-shaped, 3-sided, brown; tips long-tapered, as long or slightly longer than perianth segments; seeds numerous, tiny, egg-shaped. Habitat: Marshes, wet prairies, pond and stream edges, and roadside ditches, most abundant in sandy soils. Comments: Named for botanist John Torrey, (1796-1873), Torrey's rush is one of the most commonly encountered rushes in Kansas. It reproduces by seed and by rhizomes.